George Richardson was born in Crook in 1892. He was the first son of Yorkshire born boot and shoe maker, Thomas Richardson (1856-1906). His mother was Ellen Elizabeth Richardson nee Naylor (1853-1895), a coal miner’s daughter from Crook. He had three older sisters but two died in infancy. He lived at 28 Albert Street, Crook throughout his life. George’s mother died in 1895. In 1897 his father married Elizabeth Ann Richardson nee Willoughby (born 1870) from Crook. She was a confectioner’s daughter who had previously married John Gill in 1888. She was widowed by the time of the 1891 census and had a daughter from that marriage. Thomas and Elizabeth had two children, a boy and a girl, before Thomas’s death in 1906. His stepmother headed the household at the time of the 1911 census at which time George was working as a shop assistant in a draper’s store. George is estimated to have enlisted in the Durham Light Infantry (DLI) in January 1915. He became private 18/1204 in the 18th battalion. After training in England he disembarked in Egypt on 22 December 1915 and would have served on the Suez Canal. His battalion was posted to France on 11 March 1916. The 18th DLI was ordered to attack the Gavrelle Trench on the night of 17/18 May 1917. They made some progress but were forced back by strong German resistance and counter-attack. Both sides suffered heavy casualties. George was recorded missing in action presumed dead on 18 May 1917. 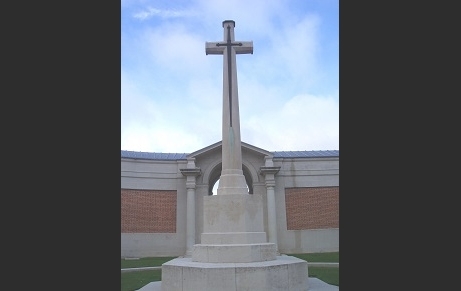 With no known grave, he is commemorated on the Arras Memorial to the Missing. It is recorded that George left £1 17s 11d each to his sister Edith and half-siblings Gertrude and Arthur. His war gratuity of £10 10s was paid to Edith. George Richardson was awarded the 1914-15 Star, the Victory Medal and the British War Medal for his service in World War One. He is remembered on several memorials in his home town of Crook.